Las Vegas police detectives are asking for the public's help to locate a suspect that shot a 7 year old girl in the back. 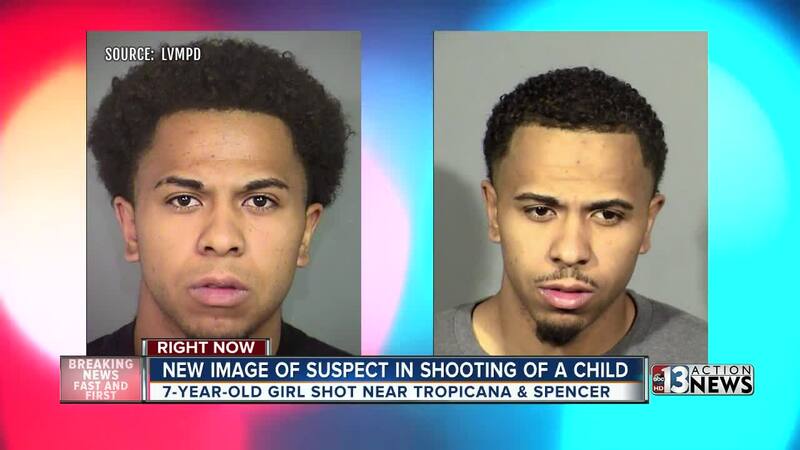 Las Vegas police said 23-year-old Curtis Truman is the gunman behind the shooting that occurred in the area of Tropicana Avenue and Spencer on Wednesday. Police said Truman is 6 feet tall and weights 160 pounds and was last seen running away from the scene. He was observed wearing a grey shirt, black shorts and has a tattoo on his left arm, according to surveillance video released from Las Vegas Metro Police. Anyone with information regarding Truman's whereabouts is urged to call the South Central Area Command Patrol Investigations Section at 702-828-8639. People with information can also remain anonymous by contacting Crime Stoppers at 702-385-5555 or visit their website by clicking here. 13 Action News spoke to the mother of the injured child on Thursday . She reports her daughter is expected to make a full recovery.